Cimbria is one of the world’s leading suppliers of high quality processing technology primarily within grain and seeds, but also within other industries such as foodstuff, biomass treatment, animal feed, and systems for a large variety of industrial products. The company has in-depth knowledge of the design and construction of turnkey projects and special installations for storage and conveying bulk cargoes. Its vast experience is constantly being put to use in developing new solutions which meet the demands of authorities and users for functionality, quality and environment friendly operation. The solutions from Cimbria are always individual ones, developed in close co-operation with the clients. Their needs and demands define the overall parameters and Cimbria makes the ends come together in simple, practical and operational solutions based on in-depth experience with the business area. When looking at solutions for the Scandinavian market, Cimbria can refer to a wide selection of solutions for different applications, including the installation of intake and silo systems and various conveying equipment. Marine Harvest is a world-renowned seafood company offering farmed salmon and processed seafood to customers in more than 50 markets worldwide. Marine Harvest is the biggest producer of Atlantic salmon in the world and is responsible for over 5 million salmon meals per day. In addition to fresh and frozen salmon, Marine Harvest offers a wide range of value-added products such as coated seafood, ready-to-eat meals, delicious finger food and smoked seafood. Though salmon is the main farmed product, the company also farms white halibut. Marine Harvest has decided to build a new fish feed factory in Norway as a greenfield project. The site is located on the west coast in Bjugn, about 100km southwest of Trondheim. Logistically, the new plant is located immediately adjacent to the sea, and most of the deliveries for the factory will arrive by ship. Likewise, products from the factory will leave the same way. Intake line from ship-unloader to raw material silos. The unloader itself will be supplied by Cimbria’s German partner Neuero. The conveying line is about 300m long. It starts at the quay and has a capacity of 300tph (tonnes per hour). Machine tower as a complete building with decks for cleaning and weighing of incoming products. The building is 9 × 16m and 40m high. Conveyor system from raw material silos to dosing silos consisting of standard heavy chain conveyors and elevators designed for 150tph. Midi and macro dosing silos, approximately 4,500m3, as a complete building including steel structures and cladding. The silo cells are made of small wall elements and outloading is in part secured by bin-activators. Finished product silo, approximately 5,000m3, again as a complete building. The silo cells are made of trapezoidal wall elements and fitted with speed-reducing loading chutes in order to handle the pellets as gently as possible to avoid any damage. Warehouse as a complete building consisting of steel frames and cladding. Approximately 1,000m2. The deliveries for the project were co-ordinated with the other contractors on the project and were commenced in spring 2013. Consignments were shipped by vessels directly from Cimbria’s manufacturing company in Thisted, Denmark, to the site. A large number of Cimbria employees were at the site during the installation period. As no hotels were available within driving distance, a villa was erected for all the workers and administration on site, including all necessary facilities such as canteen, laundry, sleeping apartments, etc. To handle special products as carefully as possible in order to avoid breakages and dust, Cimbria has further developed standard conveyor systems in order to handle products such as pellets more carefully. Improvements to the equipment have been developed in collaboration with Danish engineering company Graintec A/S, to which Cimbria has delivered this system for handling fish feed pellets. In such applications the importance of gentle product handling is essential because of the environment. The improved screws have been used in connection with the loading and unloading of vessels for transportation of fish pellets from fish feed factories to off-shore fish farms. The biggest screw conveyor has a length of 23,775mm in a single unit. For unloading Cimbria delivered different types, whereby the screw is mounted in a heavy steel construction, including a vertical character tower which can turn through 270°. The outloading arm can either be a single unit or two linked units for unloading distances of up to 14m and 25m respectively. The unloader can be lifted and lowered 15/10°. The movements are controlled by hydraulics from the ship's control bridge. The system is very easy to operate and suitable for delivery of feed to fish farms at sea. It is easy for operators to carry out the positioning of the unloader according to the feed barges. The amount of feed delivered to off-shore farms is relatively high, as the fish are normally in seawater during the growth phase. The system is a substitute for the traditional way of delivering by means of big-bags, and as the capacity is high, the unloading time is short. In addition to these very gentle conveyor screws, the plants have been fitted with open speed-reducing filling chutes in bins and containers, as gentle handling is of great importance throughout the entire product handling and storage line. Konecranes is a renowned group of Lifting BusinessesTM, serving a broad range of customers, including manufacturing and process industries, shipyards, ports and terminals. Konecranes is committed to providing lifting equipment and services to satisfy any possible need. One of the company’s most notable products in its bulk handling range is its AGD (Advanced Grab Drive) Grab Unloader. This is a prime example of the continuous development work of Konecranes in all fields of crane technology. Konecranes has delivered successfully over 20 heavy duty and high capacity grab unloaders during the last ten years. The AGD Grab Unloader, with its extremely simple rope reeving design and standardized drive machinery, provides the customer ease of maintenance and excellent operational reliability. It is the answer to modern bulk terminals’ demands for consistent performance and ultimate degree of reliability. The AGD unloader family covers all capacities and site conditions from barge unloading to the largest ocean-going bulk carriers. The unique rope reeving design and advanced AGD control system provide trouble-free operation and ease of maintenance. Konecranes electrical system: precise movements with short response times. Konecranes Crane Management System (optional) provides a broad range of reporting, analysing and remote diagnostic features. Ergonomic operator’s cab: spacious and ergonomic cab ensures productive working environment for the driver. Good visibility to all operating areas. Remote cab operation as an option. AGD machinery house: all machinery components of the four main winches are fully interchangeable. Standard Konecranes components provide reliable operation and easy maintenance. Good access to all service points. Dust free material flow: Konecranes AGD Grab Unloader can be furnished with a large variety of features to provide optimal dust free handling of practically any bulk commodity. Effective dust suppression with water mist is used for materials that occasionally cause dusting. Materials like animal feed, clinker, cement etc. require more efficient dust prevention. Dust is extracted by powerful fans from the grab discharge area in the hopper and from all conveyor loading points. Filter bags in the dust extraction units are cleaned by air after each cycle. The hopper itself is furnished with special grizzly to prevent the escape of return air from the hopper. Hopper arrangement: the discharge hopper is lined with bolted wear plates. Wind walls are standard in all deliveries. The back door is made of strong rubber sheets to withstand occasional contacts with the grab. The hopper can also be closed by hydraulic operated roof sections to prevent rain water to get in contact with material. A special spillage plate is used to prevent the fall of possible grab spillage between the unloader and the vessel. On the banks of the roaring Vindel river in northern Sweden lies Indexator Rotator Systems AB. This is where the company’s rotators are manufactured — known for their high quality and long service lifetime. The rotators are used in forestry, general cargo and materials handling. “Our rotators are standard fitting for the larger machine manufacturers. It requires deep knowledge of the harsh reality that the products will be used in,” says Gunnar Balfors, CEO of Indexator Rotator Systems AB. The man behind Indexator, Allan Jonsson, used to lift large timber logs onto trucks in the late 1950s, without the help of any lifting devices. Even then, he had started to think about what would become today’s rotator solution. His aim was to create a 360° rotator for heavy loads. He finally achieved this after much experimentation, at the end of the 1970s. From being a small company in the end of the 1970s Indexator today acts world-wide as a global supplier of rotator solutions. 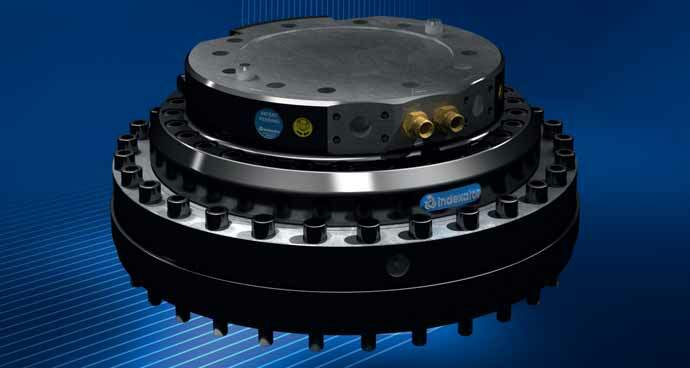 Products from Indexator Rotator Systems help machine manufacturers, contractors and operators to increase their profitability every day in over 40 markets on five continents. Despite a global expansion, Indexator is still family-owned and well into its second generation now. Since May 2012 Indexator has been divided into two technical companies; Rotator Systems and Rototilt Systems, which enables each company to focus 100% on its specific area. The common brand for both companies is still Indexator, a name and promise that customers throughout the world are aware of. Common values, such as high quality products, guaranteed delivery and reliable aftermarket service are all part of what characterize Indexator, known as the “Indexator’s philosophy”, which has gained a lot of national interest in Sweden. “We see our philosophy as a profitable investment. We have become even better at delivering high quality at the right time, with the help of our committed and involved employees.” says Gunnar Balfors, CEO of Indexator Rotator Systems AB. Successful product development is necessary to stay in a leading market position, but also requires deep knowledge of the real- life situations in which the products are used. Therefore Indexator Rotator Systems is not only a manufacturer of rotators, but also a development partner. Collaboration in product development ensures the essential interplay between base machine-crane-rotator- unit/grapple/tool. Therefore many international equipment manufacturers visit Indexator Rotator Systems to develop new products or functions, often from a given requirement or specification. “A development process and continuous dialogue with the manufacturer helps us to achieve synergy effects and fulfill, or in the best of all positive worlds, exceed customer expectations,” says Erik Svensson, marketing manager at Indexator Rotator Systems AB. Except for a wide product range of GV/AV and G/H rotators, Indexator Rotator Systems can offer a full range programme with its well-proven industrial IR-rotators, which are primarily intended for excavators and large cranes in material handling, recycling or timber handling. Indexator Rotator Systems also plan to bring a new product range to market, to address an increased demand for large rotators. “The XR Rotators will be robust products with durable slewing rings, high torque motors and easy maintenance. One of Indexator’s largest strengths is to offer a wide range of quality products, with all functions needed — and we will keep building upon that,” adds Svensson. The idea is to offer a range of rotators which is attractive for the manufacturer and end-user, irrespectively machine size, capacity or function. Indexator Rotator Systems remains keen to fulfill its assignment — continuing to develop high quality rotators. Transas Navi-Planner 4000 voyage planning software now boasts extended functionality to manage paper charts and publications. Navi-Planner 4000 has been known for electronic charts, publications and other data management for several years. Recognizing the fact that a lot of shipping companies continue using paper charts,Transas has added a new functionality to its voyage planning software providing one tool for both, electronic and paper charts management to its customers. Users can import complete vessel’s inventory or manually select paper charts held onboard. Navi-Planner 4000 then connects directly to the Transas chart server ashore to gather all outstanding Notices to Mariners within a few seconds. New Navi-Planner functionality provides a clear overview of paper charts status, and any paper chart used during a voyage will be automatically listed in the passage plan, thus making voyage planning easy and safe. Transas Group is a world-leading developer and supplier of high technology software and hardware solutions for transport, oil-and-gas industry, security, defence industry and edutainment sector. Transas Group is headquartered in St. Petersburg, Russia, where the company was founded in 1990. The number of Transas employees worldwide exceeds 2000 people. The Group’s global network includes 23 own offices and over 260 distributors worldwide, through which Transas products and solutions are successfully deployed in over 130 countries. The production process is certified according to the ISO 9001 international standard. Transas Marine International is a Transas Group company, with headquarters located in Gothenburg, Sweden.Transas Marine offers its customers state-of-the-art navigation, simulation, vessel traffic and port management solutions, backed up by a worldwide service and support network. A Turkish construction services company, Mussa Insaat Dis Ticaret Ltd of Istanbul, has ordered two road-mobile Siwertell 10 000 S cement unloaders from Cargotec in less than three months. The trailer-based, diesel-powered units will have a rated discharge capacity of 300tph (tonnes per hour) and are scheduled for delivery in mid-May 2014 and late August 2014. Further factors contributing to the orders were the well documented reliability of Siwertell mobile unloaders, along with their high unloading capacity and low operational and maintenance costs. Each unloader will be equipped with a double bellows system and dust filter, ensuring that they deliver consistently high levels of efficiency and environmental protection. “As with the first order, we take great pride in being part of the re-construction of Libya, in view of the area's recent history,” Ojeda adds. Siwertell ship unloaders and loaders are based on unique screw conveyor technology, in combination with belt conveyors and aeroslides, and can handle virtually any dry bulk cargo, such as coal, cement, fertilizer, agribulk, clinker, sulphur and grain. Siwertell plant and terminal design, ship unloaders, ship loaders, mobile ship unloaders, mechanical and pneumatic conveying systems, and storage solutions are all designed to ensure environmentally-friendly and efficient cargo operations. Siwertell is a Cargotec brand. Cargotec's sales totalled €3.2 billion in 2013 and it employs approximately 11,000 people. MacGregor, part of Cargotec, has secured a deck equipment contract for a series of eight 58,500dwt bulk carriers under construction at New Times Shipbuilding in China. The vessels are being built for Lemissoler Navigation (Front Marine), based in Cyprus, with the delivery of the first two vessels scheduled to start around August 2015. The packages include equipment from the combined MacGregor Hatlapa portfolio.“The new contract was won as a direct result of our strengthened capability for larger delivery scope and a long standing relationship with the owner,” says Jörg Tollmien, Head of Sales for the Hatlapa offering at MacGregor. “It is also a good example of what our combined product ranges can offer customers, particularly in cases such as this where an extensive scope of deck equipment is required for multiple ships,” Tollmien notes.